As the game clock at Heinz Field ticked down on the Panthers Thursday night, the already prevalent splotches of bright yellow seats grew as the paltry crowd dispersed. The team’s chances to beat a 1-6 North Carolina team were beginning to dwindle, and so was their present fan base. The idea to work on upping attendance at Pitt football games has been in the news recently, and for good reason. So many fans leave before or at halftime that the laughable decision was made to hand out beverages to students who stay for the whole game. At a recent event in her Ohio hometown, Pitt Athletic Director Heather Lyke threw out the idea to wrap extra seats at Heinz Field for Panthers football games. 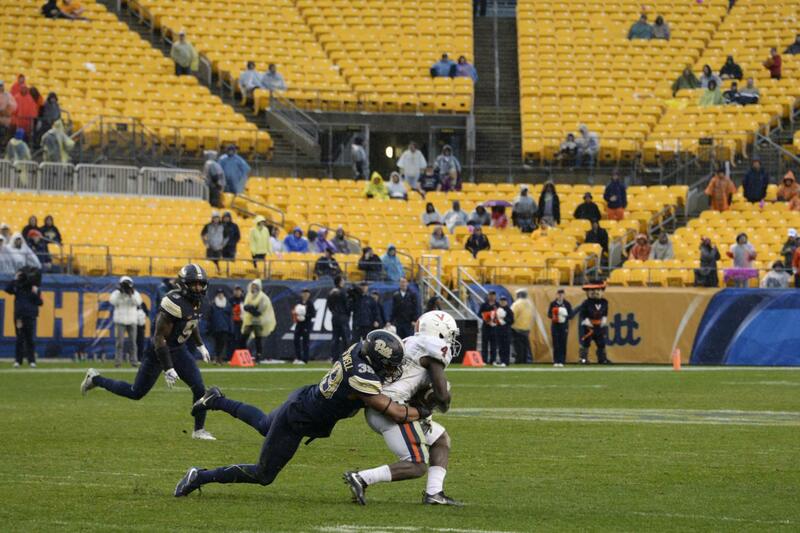 It’s an accepted fact that the Pitt football team struggles to fill up Heinz Field. People cite the stadium being off campus, not that it is a 68,000-seat professional stadium for a team representing a school of a bit more than 19,000 undergraduate students. Both are a problem for Pitt. Tarping the upper sections, if Pitt decides to go that rout, is like turning off the bathroom lights in the hope it will fix the leaking sink — it doesn’t solve the real issue of a lack of pride in the Panthers’ football program. Through the first five games of the Panthers’ season so far, they have averaged around 36,806 fans per game at Heinz Field. If that number were to hold steady for the rest of the season, it would be their second-worst since their move to Heinz in 2001. Another potential issue is that football looks better at home on the couch — or while drinking one’s sorrows away at Hem’s. On television, the cameras move to catch the action and are enhanced with insightful statistics and commentary. Commercial breaks act as a respite to go grab a snack or a slice — one that is reasonably priced. During a cold game in November, these live media breaks act as a form of slow torture for fans to freeze with inactivity and wallow in a losing score. Pat Narduzzi knows this, too, and recently mentioned it on his weekly radio show on The Fan 93.7. While college football attendance is declining nationwide, it’s not down everywhere. In 2016, the SEC ran a much-maligned commercial with the tagline “It Just Means More,” indicating that the football played in the SEC is of a higher quality and that the fans expect more. The SEC might be onto something — attendance has remained steady or risen for almost every SEC team this season. Colleges all across the country — from the dense forests of Washington state, through the fertile fields of Iowa, to the swamps of Florida — don’t have attendance problems because they have one thing in common — pride. These teams fill stadiums with fan bases that expect success, but don’t abandon their teams when it gets tough. Even if Penn State is losing, students don’t just get up and leave during the third quarter because they’re bored or have better things to do. Sure, a tarp should help make the stadium look fuller and draw the crowd into the lower sections. The problem, though, isn’t the stadium’s location and size, but something more systemic. Increasing excitement over the team and the game day environment is what will help Pitt succeed. There is no tailgating culture, which is what a lot of fans of schools like Ohio State and Penn State live for. There is also no excitement on campus during game day in general — the most commotion occurs in the line of drunk students waiting to board buses on Bigelow Boulevard. Pitt has traditions, sure. Students lock arms to sway and sing Neil Diamond’s “Sweet Caroline” when it comes over the loudspeakers at Heinz Field. The night of a big football win, the victory lights bathe the Cathedral of Learning in a glorious glow. But when the Pitt football team — mired in mediocrity — loses to an opponent with one win, the students hunch their shoulders in a light shrug. Everyone is disappointed, but unsurprised, and goes about the rest of their day. A tarp isn’t going to solve those problems. Maybe they could improve the the way Heinz looks on camera, but a tarp can’t sport Pitt gear, drink a beer or cheer on the team. What Pitt needs is a strong fan base, and a quick “fix” like making the stadium smaller or offering up bottled drinks won’t work to make this happen.